It’s that time of year again! 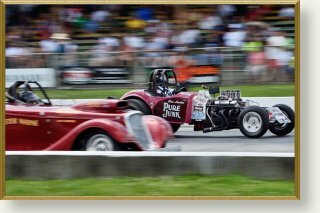 Mid-June means the east coast Hot Rod Reunion at Beech Bend Raceway in Bowling Green, KY. It also means thunderstorms, high temperatures, and muggy humidity. I wasn’t there on Thursday so I missed the thunderstorms although I did hear they were pretty rough. The high temperatures could have been worse, around 90° which is actually not too bad for this time of year. The humidity was pretty rough after the rain on Thursday. Despite spending two days there I barely scratched the surface of seeing everything there. I love show cars, and I admire the work that goes into creating and maintaining one, but my first love are race cars so I spent both days hanging around the drag strip. Lots of sensory overload as usual. The sounds, colors, smoke, and speed are what some of us live for and it’s hard to explain why to others. It’s just one of those things that one either loves or doesn’t and I do! Unlike previous years the event this year was not a concurrent NHRA and NDRL event. I don’t pretend to know exactly what transpired however it was announced at the NDRL awards banquet late last year that NDRL would not hold their June race at the Hot Rod Reunion, rather it would be held at Memphis the weekend before the Hot Rod Reunion. I don’t know who got their feathers ruffled but they need to get over it. My understanding is that the NDRL race at Memphis was not well attended, by competitors or spectators, and the NDRL competitor’s presence at the Hot Rod Reunion was most assuredly missed. It is my hope that next year things will be back to normal again. I talked with one of the funny car owners on Friday and mentioned that these cars are the ones that I remember. He laughed and said, “Me to!” Today’s Top Fuel cars are materpieces of performance and technology but these “Nostalgia” machines are just so simple in comparison. I can look at one and know what virtually every tube and wire is for and what they do. Not so on a current Top Fuel car.&nbsp They are far more complicated and instead of a crew of 2 or 3 people they require a team of a dozen or more. Which is best? I have no idea. I love to watch them ALL and I’m glad that they are both there. I’m grateful for the technological and preformance advances the Top Fuel and Fuel Funny Car guys are have managed to find, but at the same time I’m extremely grateful to the Nostalgia guys for keeping the old world alive. ON THE TRACK – FRIDAY, JUNE 16, 2017 …. When the Top Fuel, Fuel Funny Car, and Fuel Alterds started to run I wandered down to the starting line to be cloe to the action. Even though these are “Nostalgia” cars, and MUCH less powerful than their fuel brethren of today, being that close to a pair of fuel ANYTHING launching is quite an experience. ON THE TRACK – SATURDAY, JUNE 17, 2017 …. It’s hard to pick a few favorites. Many of the same cars that were my favorites Last Year were there again this year. While they are still special I’ll intentionally pick a few that haven’t been chosen before. Let’s start with Gordon Horn’s immaculate Pro 7.0 Corvette. I’ve seen this car at a number of NDRL races and it is always fast. Another Corvette, this one a Top Sportsman running in A-Gas this weekend and driven by Randy Alexander. I’ve seen “Down Under Thunder” a number of times. The owner, Barrie “Bazz” Young, is an Aussie transplant and a very nice gentleman to talk with. I hadn’t seen Paul Romine’s Man O’ War fuel Mustang funny car before, but I hope I get to see it again!